We've all asked the same question: "How often should I get my oil changed?" It's possible you've heard a wide range of answers as well, which could be pretty confusing for any consumer. Luckily, you stumbled upon the right blog post. The following covers how often you should change your oil, as well as the benefits of timely oil change service and the consequences of putting it off. When you're done, find out more at your trusted Flagstaff car dealership - Flagstaff Nissan. A great rule of thumb is to take your vehicle in for oil change service every 3 months or 3,000 miles. It's the best way to keep your engine good and lubricated, and running at its peak. After 90 days of commuting back and forth from work, motor oil tends to get dirty. It becomes dark, gunky and ultimately less effective. It could also burn away, leaving you with no lubrication at all. Adhering to the 3-month, 3,000-mile rule should keep you fresh and full, but you should check your oil periodically as well. Check for signs of dirty oil, and more importantly, make sure it's not running low. If you'd rather receive an expert opinion, just ask the certified technicians at the Flagstaff Nissan auto repair department. They're factory-trained, industry savvy, and always trustworthy so you can count on honest, manufacturer-recommended advice every time. Call or stop by the Flagstaff car dealership today, serving Winslow and Sedona, AZ. Flagstaff, AZ is one of the greatest places to drive. Cruising with the windows down, enjoying the Northern Arizona weather - what's not to love? Routine oil change service will keep your car, truck or SUV healthy, so you can enjoy the ride for a long time. Motor oil plays a crucial role in your vehicle's life span, by lubricating critical metal parts so they continue to run smoothly. While steady maintenance is essential, it's also important your car receives the proper maintenance, including the right oil, oil filters and more - one more reason to visit Flagstaff Nissan. Its automotive repair and service department is equipped to deliver vehicle manufacturer recommended oil change service for any make or model. It doesn't have to be a Nissan; Flagstaff Nissan is always ready to provide world-class maintenance on any make or model. 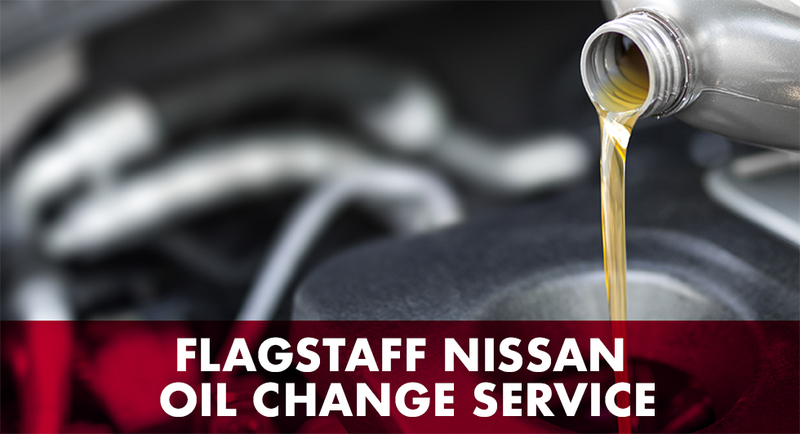 Find the Flagstaff-area car dealer online - just search "Nissan Flagstaff" and schedule oil change service today. Now you know how routine oil change service helps, but what if you don't maintain your vehicle? Well, a whole lot of bad can happen. Your engine requires proper lubrication. Otherwise, metal on metal parts begin to grind and dull out, which could lead to pricey auto repairs. In the worst-case scenario, your entire engine could seize. At that point, you might not be looking for auto repairs. You could be looking for a brand-new car. Nowadays, different vehicles require different care and not meeting their individual criteria could result in problems as well. Some engines can function with conventional oil, while certain newer models demand full synthetic oil or a synthetic blend. Many early-model vehicles require special treatment as well. If your car, truck or SUV has more than 75,000 miles, you may consider using high-mileage oil, which contains ingredients to prevent leaks, plus other helpful additives. Remember - schedule oil change service every 3 months or 3,000 miles. Check your dipstick every now and then too, because the consequences could be devastating. Drivers in Flagstaff, Sedona and Winslow, AZ don't have to go far for premium oil change service either. Visit the Flagstaff Nissan Service Center, located at your trusted Flagstaff car dealership.